The "Bible Code" is a way of looking for hidden prophecies and passages in the Bible, by using a software program to search for messages in the Old Testament Hebrew text. The spaces between words are eliminated, so that the Old Testament is a continuous block of Hebrew letters. Then, by skipping letters at a programmed interval, the program searches for words. There appear to be patterns to the passages where the words are found. The Bible Code also works in English, in the King James Bible. This method was popularized by the excellent book "The Bible Code", by Michael Drosnin. He also has a second book, that is very interesting reading: "Bible Code II: The Countdown", by Michael Drosnin, published by Viking Penguin, 2002. And Michael Drosnin's third book on the Bible Code was published in 2010: "Bible Code III: Saving the World", by Michael Drosnin, published by Worldmedia, 2010. See this page for more on this subject. The web pages of this web site that are listed below, on the King James version English Bible Code, discuss research I did on an English Bible code in the King James version Bible, using Bible code software on my PC. I used CodeFinder Millennium Edition software, which does ELS searches in the King James English Bible, as well as Hebrew and Greek Bible searches. By using this Bible code software I searched for some words in the King James New Testament and Old Testament (separately). I usually had Row Splitting set to Auto (one of the settings with Codefinder software). I found that there is evidence of English Bible code patterns that the software found by skipping varying intervals, in the King James Old Testament or New Testament, made into a block of solid text. The pages listed below show King James version English Bible Code matrices on different subjects, including prophecies of the future and the world today. You will see here Bible Code matrices in English in the King James Bible on many different subjects. 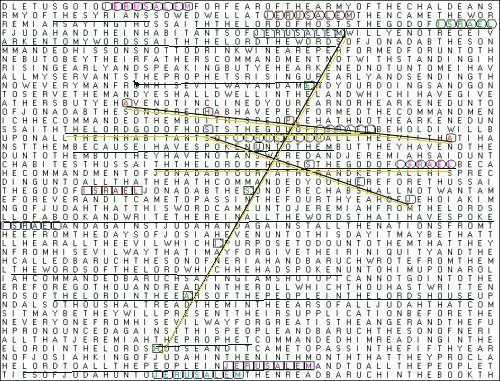 Some of these matrices may reveal the future for us, as hidden prophecies in the King James Bible Code. Page 1b: The Future of the Muslim Dome of the Rock in Jerusalem, and will there be a rebuilt Jewish Temple on the Temple Mount? Page 6: Physics: Cold Fusion, can it generate nuclear power? Is Time Travel possible? Page 6a: Physics: String Theory, the M-Theory, Other Dimensions, and a Unified Theory of Everything. Page 7a: Geology: Discovery of oil wells in Israel? Page 8: Could a volcano in the Canary Islands result in a giant tidal wave hitting the U.S. and Europe? And could a supervolcano explode at Yellowstone in Wyoming? Page 8a: Could a giant magnitude 8 earthquake shake the San Andreas Fault in California, in the near future? Or could a tidal wave hit California? Page 10: Ebola Disease, the deadly virus of Africa; could it cause a worldwide plague? Also, AIDS and HIV, Mad Cow Disease (BSE), Influenza (bird flu), MERS. Page 10a: Autism disease in children. Page 11: Could an asteroid or comet hit earth soon, an ocean impact, 7 pieces, 7 hits, tidal wave), causing an Extinction Level Event (ELE)? Page 14a:John Titor and his story of time travel and prophecies. He said he was from year 2036. Page 16: The Voynich Manuscript, can the Bible Code decode this strange book? "Revelation 13: The English King James Bible Code"
Click Here to Visit Kristi Ann's Haven Top Christian Sites! "Revelation13.net: The English King James Bible Code"